While the tech press was obsessively covering the onslaught of Ultra HD TVs and uncovering unlicensed celebrity headphones at CES 2013, the mainstream media were fawning over a fork. Now HAPIfork, the "smart" utensil with an altruistic mission and a healthy helping of tech baked in, is taking to Kickstarter for funding -- albeit two months later than originally reported. Starting today, the first 2,500 backers can get their hands on the Bluetooth-equipped fork for $89, with subsequent backers pitching in $99 for a device. Those who want to get in even earlier on the action can give $300 for a chance to be part of the beta program. The overall goal -- aside from getting you to masticate at a reasonable clip -- is set for $100,000 with fundraising ending May 31st. Devices are expected to ship to backers in Q3 and hit unspecified retail locations in the US and EU in Q4 this year. We got our hands (and mouths) on a prototype that HAPILABS president Andrew Carton referred to as 95 percent final. To find out how our lunch with the vibrating fork (and the Ahi Tuna) went down, check out our impressions after the break. Along with Carton and the company's press agent, we were accompanied by HAPILABS' CEO Fabrice Boutain. None of them touched a single bite. They were, however, quick to offer statistics and anecdotal evidence about the benefits of slowing down at the dinner table. With all of that talk about gluten intolerance, gastric bypass surgery and emergency trips to the hospital brought on by crippling indigestion, it was time to dig in. As a refresher, the HAPIfork records each bite you take and gives off a subtle vibration when you eat too fast. The forks on offer came in three colors (green, blue and pink) and were equipped with a capacitive sensor, Bluetooth 4.0 and micro-USB for charging and data transfer. Future iterations will include an accelerometer and the team envisions producing two versions in two years time: one with increased functionality and another, more affordable device starting at $50 as production scales up. They take us back to simpler days when our little hands gripped giant pencils to scrawl our names on wide-ruled paper. Seeing as the outfit's spoon isn't ready for primetime, our first task was finding an appropriately fork-able food. In order to combat the pitfalls of a primarily sedentary occupation and to avoid things getting too messy on camera, Michael Gorman and I landed on a pair of salads, and each selected a fork in the color of our choosing. As we noted at CES, the utensils don't feel particularly cheap or light, despite an almost toy-like appearance. They do, however, take us back to simpler days when our little hands gripped giant pencils to scrawl our names on wide-ruled paper. Simply put, the HAPIfork is huge, but not unwieldy. Carton said he hopes the fork will get smaller in the future, but added that the cost of R&D has made size a secondary concern for the time being. After a few bites, our minds were more occupied with the tool's functionality than its girth, anyway. We took a tag-team approach to this particular hands-on with self-professed slow eater Gorman tackling a chicken salad and myself -- always the first to finish -- shoveling down a Nicoise salad. While ours were set with a goal of ten seconds between bites, the finished product will be programmable to your pace of choice via a companion app or web interface. Michael's fork was mostly inactive due to his grazing method, forcing him to speed up for feedback and simultaneously proving its creators' assertion that the HAPIfork isn't for everyone. I, on the other hand, felt the feedback on first bite -- and second, and third. It's a mild vibration -- something like the feeling you get when your phone vibrates through a coat pocket -- but it's enough to trigger a reaction. By the time I was four bites in, I was making a conscious effort to keep the buzz at bay and, as a result, chewing significantly more before swallowing. It's a mild vibration -- something like the feeling you get when your phone vibrates through a coat pocket -- but it's enough to trigger a reaction. We only got a quick glimpse at the company's accompanying iOS app, which is still in beta, but Boutain did offer a few details on that front. HAPILABS is currently working on apps for iOS, Android and Windows Phone and "seriously considering" developing for BlackBerry. Those apps will allow you to take a picture of your meal for logging purposes and will communicate via Bluetooth 4.0 or USB to provide stats on the time and duration of your meal, how many bites you took and the number of seconds between bites. Along with data tracking, the apps will have an opt-in social networking function that allows users to share goals and stats as well as a family-friendly game. It's still too early to tell what impact, if any, smart utensils will have or, for that matter, if the company's Kickstarter campaign will indeed be a success, but as Carton points out, "this isn't a magic pill." It is a strange little device that has the potential to make us think, even if it's just about how fast we eat. REDWOOD CITY, CA--(BUSINESS WIRE)– HAPILABS, a company whose mission is to help individuals in the 21st century take control of their HAPIness, health and fitness through applications and mobile connected devices, today announced the start of their Kickstarter crowdfunding campaign to raise funds for the manufacturing and distribution of HAPIfork - the world's first connected fork. HAPIfork transforms people's relationship with food as it monitors how fast the user is eating and helps them slow down. Unveiled at the Consumer Electronics Show (CES) in January, HAPIfork was the recipient of the CES Innovations Award, Health & Wellness category. The word quickly spread in over 50 countries globally culminating in hundreds of articles, blog posts, tweets, television and radio appearances as well as a fun shout out from The Colbert Report and the Jay Leno Show. "While our product is still a prototype, we're thrilled by the global response so far," says Fabrice Boutain, HAPILABS founder. "We believe this is affirmation of the growing consumer health awareness movement to gain better control of issues impacting weight and digestive issues as well as more serious issues such as diabetes and other chronic conditions." Keeping in line with Kickstarter rewards at various funding levels, the HAPIfork will be offered as a perk for up to 2,500 people funding $89, and at the $99 level for anyone else who would like to be in the first commercial batch. In addition, the opportunity to be part of the beta testing program, receiving the HAPIfork at the earliest possible availability date, is offered at the $300 level perk. The campaign which starts today and runs until May 31, 2013, has a fundraising target of $100,000. HAPIfork was designed by French entrepreneur and inventor Jacques Lépine whose idea was based on research which shows that by eating slower, people can improve the way they feel, improve their digestion and lose weight. HAPIfork aims to modify eating behavior by slowing down how fast people eat and being more present with when and how long it takes to eat, leading to an overall healthier state of being and living. Unlike other health related tools, the HAPIfork is inconspicuous and appropriate for out of home use. The Bluetooth enabled smart fork also collects information for future analysis or monitoring in clinical settings. All data is transmitted to a 'personalized online dashboard' when the HAPIfork is connected to the users computer or mobile device making it easy to monitor eating habits and health improvement at home or on the road. HAPIfork will be released in three colors (blue, green and pink) and will ship to Kickstarter funders first before the general public. 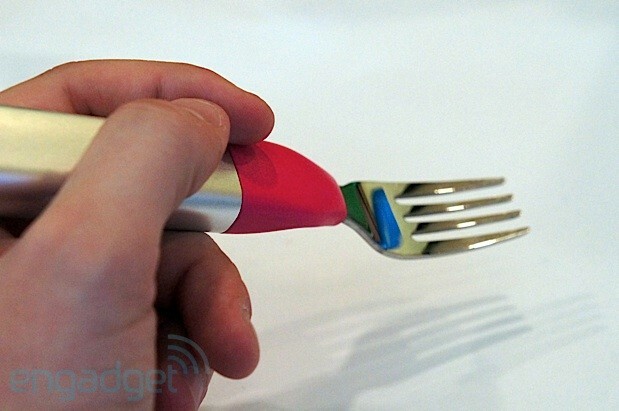 HAPIfork comes with an color coordinated case making it easy to carry everywhere. The product will initially go on sale in the US and EU in the fourth quarter of this year. Michael Gorman contributed to this report.